We ship via DHL express. it takes about 3-7 days shipping time to the whole world. The default material color is white or red ,but they both can emit 7 colors. It could be only folded parallel to the fiber optic direction.Do not fold it vertically to the fiber optic direction, otherwise the fiber optic will be damaged. When you fold it vertically to the fiber optic direction, please put somethings like bubble wrap in the fold position. It can be gently hand washed (scrub only,can not knead and twist ) with water up to 50 degree centigrade and natural soap, but the battery box must be taken off or kept away from water before washing. If battery box is taken off, pls keep the plug of wire away from water. This fabric must not be washed in washing machine. Dryer or iron is forbidden.Hang dry only. The fiber optic clothing is the best novelty gift for Christmas new year birthday and festival. 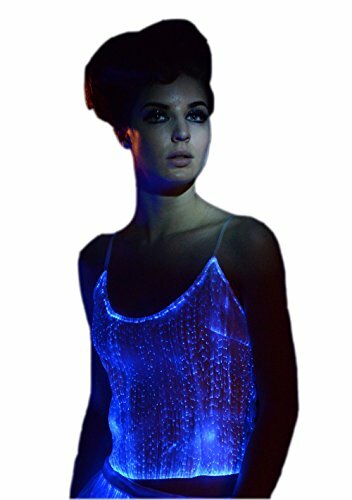 The LED lighting glow in the dark dress is perfect for party,stage,club,dancing,show,ballroom and so on. If you have any questions about this product by Fiber Optic Fabric Clothing, contact us by completing and submitting the form below. If you are looking for a specif part number, please include it with your message.